I realized over the past couple of days that these two circuits are indistinguishable with an impedance spectrum, if you don’t know any of the R or C values. The series-parallel circuit has impedance , which can also be written as . The parallel-series circuit has impedance which can be written as . If we are given R1, R2, and C2, we can set and to get the same impedances for both circuits at DC and infinite frequency. If we set , then the impedances are identical for the two circuits at all frequencies. There is one way that we can distinguish between the circuits, but it is pretty subtle, relying on thermal effects. The overall power dissipation is the same for both circuits with any given input voltage waveform, but the heat will be distributed differently. 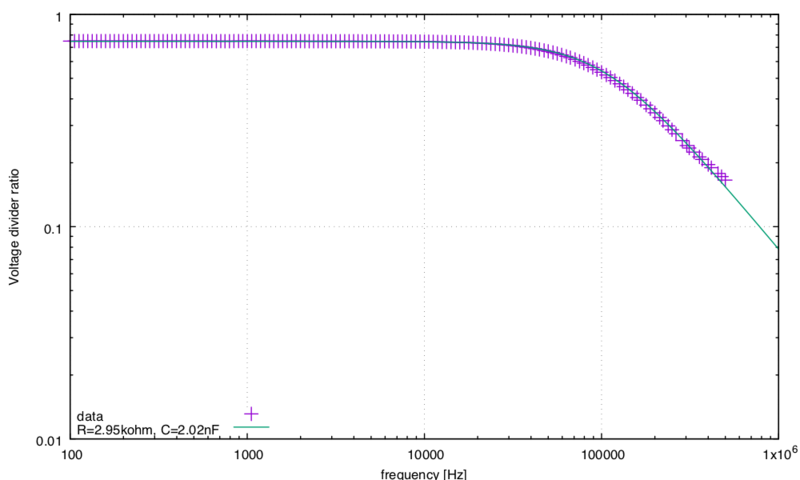 At high frequencies, the energy is dissipated in R1 and in both R3 and R4, but at low frequencies the energy is dissipated in both R1 and R2 or in R4. The thermal masses will be different in the two cases, and so the temperature rise will be different, which can theoretically be detected by differences in the noise spectra of the thermal noise from the resistors. If the resistors were mounted on a sufficiently thermally conductive substrate, so that the temperature rise was the same for both resistors in each circuit, then even this subtle detection would not be possible. 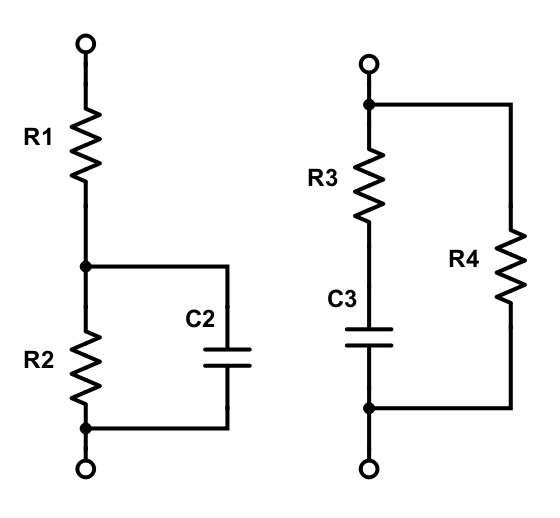 A similar analysis of the impedances can be made if R1 and R4 are replaced by capacitors C1 and C4, so there are really only two distinguishable 3-component RC circuits: R1+ (R2||C2) and C1 + (R2||C2). Others either reduce to one of these or reduce even further to 2-component or 1-component circuits. I have been planning to add a little to the loudspeaker-impedance lab in BME 51B for the spring—a simpler measurement and modeling warmup using series or parallel RC circuits. The idea is to give each group a different unknown impedance, which consists of a resistor and capacitor in series or in parallel, then have them measure the impedance with the Impedance Analyzer function of the Analog Discovery 2, and fit a model (R+C or R||C as appropriate). The idea is to give the students a simpler warmup exercise for collecting and fitting data, before they tackle the more complicated loudspeaker model. To make the unknown impedances, my son and I designed small printed-circuit boards that could take up to 6 SMD components (1206—or 3216 if you prefer the metric designation). The components are fairly large, and so not too difficult to hand solder, and I bought an assortment of resistors and an assortment of capacitors from AliExpress to populate with. The schematic for the impedance token is designed to allow several different RC circuits—both as single impedances or as voltage dividers. 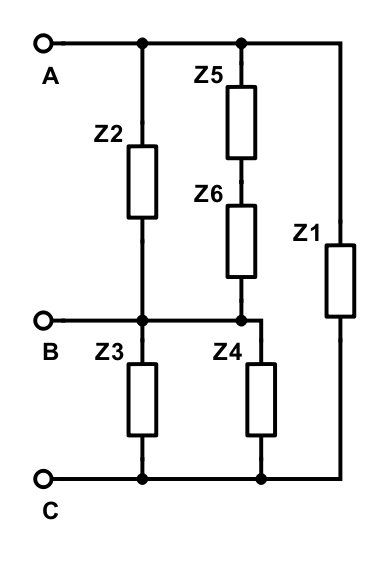 All possible 2-port, series-parallel circuits of 3 components can be wired between two adjacent pins, though three components in parallel requires adding an extra 0Ω component to get Z2||Z3||Z4 (shorting Z1). Of the 10 possible 4-component, 2-port parallel circuits, 6 can be made between adjacent pins, 2 only between pins A and C, and 2 are not achievable on the board. The top shows a panel of 10 boards as delivered by Seeedstudio. The middle row has the boards after breaking apart and sanding the edges. 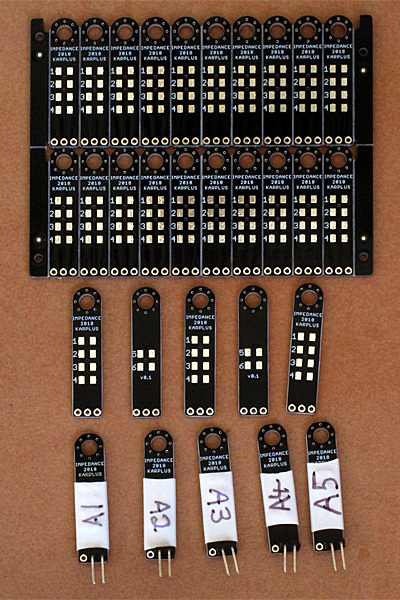 The bottom row shows the boards populated, with heat-shrink tubing to hide the components and label the board. I had the boards made by Seeedstudio this time (rather than SmartPrototyping), because I had a coupon code for a discount and because Seeedstudio did not charge extra for fancy colors of soldermask. Seeedstudio had to email me to ask if I was willing to accept panelizing, while SmartProtoyping puts that question on their web form when the job is submitted. The hole at the top of each board is for hanging the boards from hooks or putting them on a keychain—I’m going to have to do something to make sure that I get all the tokens back after each lab that uses them. One problem I’ve found in characterizing the boards is that the screwless terminal on the adapter board for the Analog Discovery 2 impedance analyzer has its contacts recessed too deep—the header pins can’t reach the contacts. I’ve found the screwless terminal to be more of a nuisance than timesaver, both because the contacts are recessed so deep and because the release buttons are difficult to press. I’m considering buying a 0.1″-pitch, 2-contact screw terminal to replace the screwless terminal with. When I tried adding wires from the adapter board to a breadboard, I got inconsistent readings with about 10Ω–20Ω resistance in series with what I was measuring—I think this may have been bad contacts in either the screwless terminal or in the breadboard. I switched to using the breadboard directly with my own reference resistor rather than using the impedance analyzer adapter board and had no further problems.